The UCBT officially unlocked its East Village expansion Tuesday night, The UCB East (aka The Beast). But judging by the utter lack of wacky inflatable arm tube dudes and the three random people in the crowd for its first show (a screening of Wild Girls Gone), it’s not ready for a Theater Magazine feature story yet. I strolled through, snagging shots of the new space. It seats a 100 maybe and is both long-ish and narrow. You’ll need to speak with your diaphragms inserted to reach the lurkers in the back. Oh, and the stage is small, probably 12-14 feet wide? 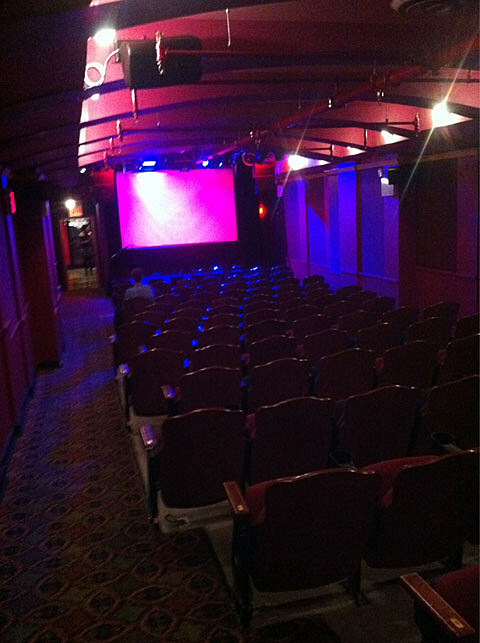 UCB West devotees will be majorly disappointed by the clear, unobstructed view from every seat. The venue has a foyer and a roomy spillway, which means you’ll be able to shotgun PBRs before and after a performance without getting rained on. BYOB for now though til the liquor license fairies come by. The Beast is located at Avenue A and 3rd Street. Initial schedule, including Totally JK with Joe Mande, Noah Garfinkel, Eugene Mirman AND DAS RACIST tonight (9/8), below!